Soon, the annual festival of lights, Deepavali, arrives. For once, Rukmani has enough money for her children to partake fully in the festivities—she gives each child some coins to spend on fireworks and makes candles to light during the night. That Rukmani normally can’t afford fireworks underlines just how impoverished her family really is, despite her determined optimism. When it gets dark, Rukmani decorates the outside of her house with candles. From the town, fireworks are beginning to be visible, and her own children are setting off the fireworks they’ve purchased. Only Selvam, the youngest, is wary, telling Rukmani that that he’s afraid. Selvam refuses to come into town after dinner, and Irawaddy stays with him; when she sees people in the village, she feels the humiliation of her failed marriage afresh. While the closeness of the village empowers Rukmani and makes her feel safe, it’s repressive to Irawaddy, who is unable to fulfill expectations for women in the same way her mother does. As Rukmani approaches the bonfire in the center of the town, she remembers Janaki, who had celebrated with her last year. Her absence now reminds Rukmani that she has no idea what’s in store for her in the next year. However, she quickly dismisses the gloomy thought, seeking out “perfection of delight” in this rare time of celebration. Rukmani’s ability to accept the frightening unpredictability of the future allows her to stay calm throughout much suffering. At the same time, it prevents her from taking steps to achieve a more secure life. Everyone is gathering around the bonfire in the center of the village, and Rukmani loses track of Nathan and her sons. At first she tries to look for them, but in the excitement of the beating drums and blazing fire, she soon forgets about him. Rukmani watches until the fire dies down and the drums stop. This is a rare moment in which Rukmani is separated from her family, reminding the reader that even though she’s a devoted wife and mother, she still has a highly individual inner life. When she finds Nathan, he is giving piggyback rides to all the boys at once, to the amusement of other villagers. Rukmani chides him gently, but he says he’s been infected by the “joy in the air.” Putting the boys down, he swings Rukmani around in his arms. He says he is happy because his life and children are good, and his wife is best of all. Rukmani’s affectionate and highly physical relationship with her husband refutes stereotypes that Indian society uniformly represses female sexuality. At home, the children fall asleep quickly. Rukmani stretches out next to Nathan, aware that he’s still wide awake. She closes her eyes, trembling with desire, as her husband reaches for her. Markandaya was revolutionary for her time in explicitly depicting positive female sexuality, as seen in this passage. Connelly, Irene. 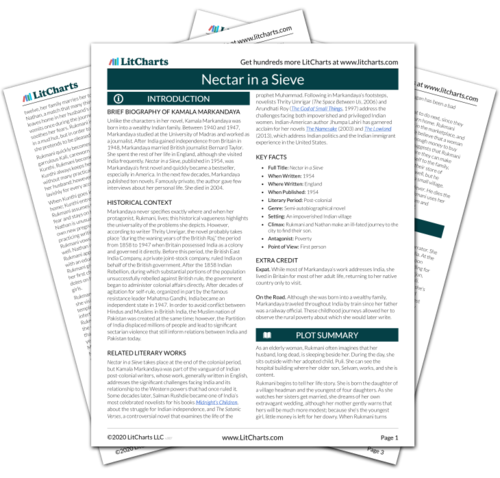 "Nectar in a Sieve Chapter 10." LitCharts. LitCharts LLC, 30 Oct 2018. Web. 11 Dec 2018. Connelly, Irene. 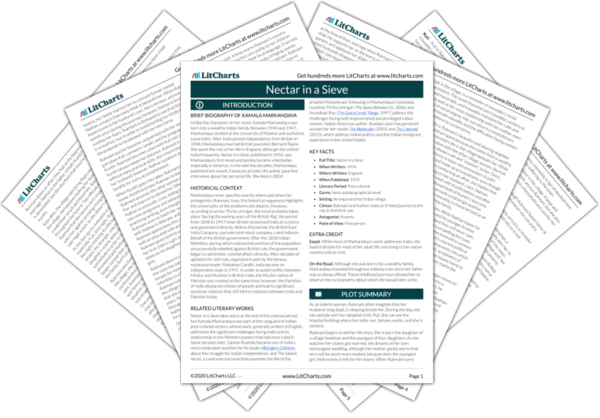 "Nectar in a Sieve Chapter 10." LitCharts LLC, October 30, 2018. Retrieved December 11, 2018. https://www.litcharts.com/lit/nectar-in-a-sieve/part-1-chapter-10.